Pipevine swallowtails (Battus philenor) have a wide range. They can be found throughout the Unites States, except for the extreme northwestern states. However, it is more commonly seen in southern states than in northern states. You can recognize pipevine swallowtails by the single semicircular row of orange circles on the underside of their wings. 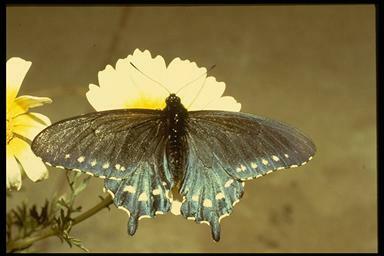 Pipevine swallowtails are generally safe from predators. This is because the pipevine swallowtail caterpillar feeds on the pipevine plant (Aristolochia macrophylla) and snakeroot (A. serpentaria). These plants contain toxins which remain present in the body of the adult butterfly. As a result, if a predator, such as a bird, eats one of these butterflies it gets very sick. The bird remembers the experience and won't eat this butterfly, or any butterfly that looks like it, again. Female pipevine swallowtails have larger whitespots on their front wings and less colorful hind wings than males do. They lay orange eggs in clusters on pipevine and snakeroot plants so that the larva has something to eat when they hatch. The caterpillars are somewhat unattractive - blackish-brown in color with raised projections on their bodies. 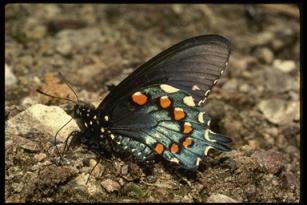 See Countrynaturals.com for a photo of the pipevine swallowtail caterpillar. When they are mature, the caterpillars form a chrysalis or pupa. The butterfly usually remains in this stage over the winter and emerges as an adult butterfly in the spring.